BARRY GERAGHTY is confident of returning in time for Aintree but a crunch MRI scan on Tuesday morning will determine whether he will make it back for a lavish books of rides that includes Buveur D'Air, Defi Du Seuil, Unowhatimeanharry and, possibly, Cause Of Causes in the Randox Health Grand National. JP McManus's number-one jockey missed the Cheltenham Festival after a Kempton fall from Charli Parcs last month left him with a punctured lung and six broken ribs. Geraghty has made good progress over the last four weeks and says he is "champing at the bit" to return. He said: "I have an MRI scan on Tuesday morning in Naas that Adrian [McGoldrick] set up for me and that will tell me where I stand. I'm presuming I'll be fine for Aintree and I'm champing at the bit to get back. I cannot wait. "It's been progressing well and I'd imagine there will be big improvement within the next week, which will leave me right for Aintree. It has been four weeks now and, fingers crossed, it will continue to heal. The ribs are a bit uncomfortable but they seem to be coming along nicely. I've never had a lung problem before so I'm not sure what way it's supposed to feel. It's unknown territory for me." 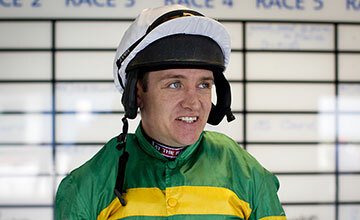 Geraghty found watching Cheltenham from the sidelines almost as painful as his injury. He said: "Lets just say I was glad when it was all over. I watched most of it at home and Gold Cup day down at Kerry. It wasn't easy." But there are Cheltenham winners waiting for Geraghty at Aintree if he does win his fitness race and he cannot wait to get back on board impressive Triumph Hurdle winner Defi Du Seuil in the Anniversary 4-Y-O Novices' Hurdle on day one on Thursday week. "Defi Du Seuil is just a gorgeous horse. I love him. He was very impressive at Aintree and it would be great to get back on board him," said the jockey. Geraghty was understandably impressed by what he saw from Buveur D'Air in the Champion Hurdle, but warned not to give up on Yanworth. He said: "Buveur D'Air was very good in the Champion Hurdle. I always knew he was capable of a performance like that and he went out and did it on the day. It was a faultless performance really. But that was definitely not the real Yanworth. He's a lot better than that." Cause Of Causes, a nine-length winner of the Glenfarclas Cross Country Chase at Cheltenham, is the shortest priced of the McManus runners in the Grand National, but Geraghty said no decision has been made on which horse he will ride. He said: "Nothing has been decided yet. I suppose we'll get Tuesday out of the way first and see how I get on and then we'll sit down and discuss things."